As a first year broadcasting/ journalism student at the University of Wolverhampton, our instructor, Dr Judith Wester, asked us to use semiotic techniques to explore images that represented the idea of death in various forms. This is a modified version of my examination of the image I chose, leaving out some of the academic ideas to present here as a blog. To begin with, I was somewhat sceptical about this task. I thought that analysing an image related to death, by investigating signs and symbols, would be straightforward and not challenging in any way; how wrong was I? Firstly, I realised that by selecting a picture, which was indirectly linked to death, my analysis could be deeper and more thought provoking. I had heard about Picasso’s ‘blue period’ on a game show, and it was mentioned that all of his paintings during this time were a tribute to his friend, who committed suicide at the age of twenty one. 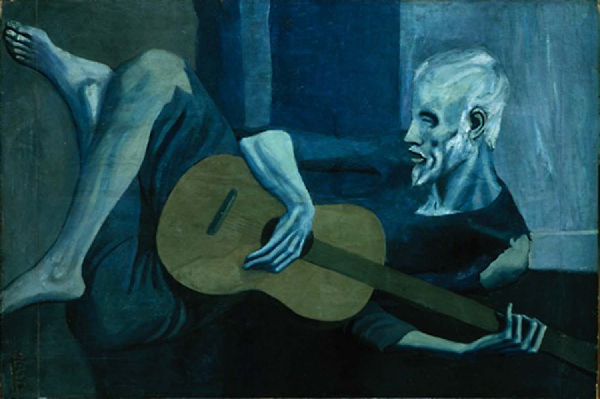 I then trawled through a website honouring the work of Picasso, and the ‘Old Guitarist’ painting appealed to me. I could see the anguish clearly in the face of the protagonist, and realised that there must be a story of symbolical importance behind it. The essay also demonstrated that identifying signs and symbols is a complicated task. This has increased my knowledge and overall awareness of semiotics and death. From a connotative perspective, there is no boundary to analysis; and that there are many and varied interpretations for one image. It occurred to me that death was a vague, yet an identifiable concept. Previously, I have never really given death a second thought, I have always recognised the inevitability of it, but did not understand the complexity of the signs and symbols that might be associated with it. I have since recognised that death is not just about funerals and the colour black but through sound, mise-en scene, camera angles and lighting etc, it can be conveyed in numerous forms. 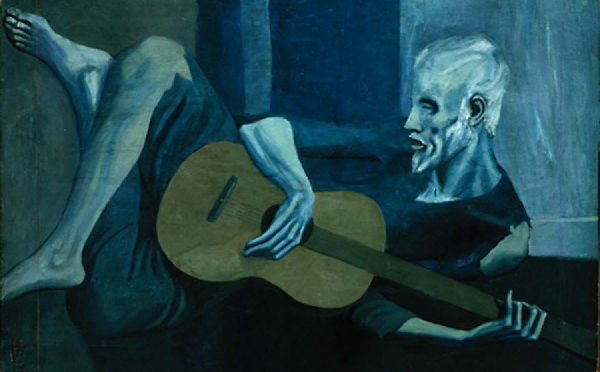 The Old Guitarist is a piece of artwork created by Picasso in 1903. It is one of the most prominent paintings in the Italian’s ‘blue period,’ which started in 1901 and ended in 1904. I discovered the image on www.pablopicasso.org, which features a range of his artwork, famous quotes and a biographical section. I started to examine this image, with semiotics in mind, linking this to the subject of death. The image depicts a blind, almost skeletal individual playing solemn music on the streets of Barcelona. Picasso uses monochromatic shades of blue, to emphasise the misery of the depleted and fatigued protagonist. The ‘blue period’ began as an unorthodox tribute to Picasso’s friend Carlos Casagemas—a Spanish art student who committed suicide at the age of just twenty-one. Many of Picasso’s paintings highlighted the abject penury that some people were forced to endure during that time period. He often attempted to sympathise with the sick and those who were cast away by society. The protagonist in the Old Guitarist painting is a blind man, who appears lonely and separated from others. Picasso’s friend Carlos, was a troubled young artist, many of his paintings featured similar individuals to the man depicted in the Old Guitarist, whose state of mind appeared to be fragile. Perhaps Picasso, through the illustration, was conveying how Carlos felt during this period of his life. It is possible that loneliness and separation are contributing factors to Carlos’ death. If we look at the Old Guitarist as a discussion of death several things come to the fore. The signifier is the guitar, it signifies the representation of music and the signified can be interpreted as the hope which music can bring. Interestingly, the brown guitar is the only part of the image that is not painted in monochromatic shades of blue. This further reinforces the idea of the symbolic nature of the guitar; music can be comforting, and can be a way of immersing yourself within a completely new universe. Therefore, the guitar requires a different colour, to separate the sombre mood along with the connotations of death that the rest of the painting emits. In addition, the Guitar is the referent in the image. The referent can be defined as a ‘state of affairs in the world outside of language’. Furthermore, because music represents expression in an alternative way to language, it can be concluded that it exists in a world outside of language, as it enhances meaning in a creative fashion. Iconic signs include the haggard look on the protagonist (Old Guitarist), his skeletal body frame and his ripped clothing. This all adds to the realistic representation of a homeless person or busker, which is what we assume the man is in the painting. Symbolically it can be concluded that the image represents a time period, possibly the 19th century when abject penury and a poor quality of life became a common occurrence in England and other European nations. In addition, the average life span was considerably shorter than it is today, and therefore, death at an early age was a common occurrence due to factors including: poor diet, lack of medicine and poor lifestyle etc. Indexical signs are ‘casually connected with what it serves to indicate’. The subtle notion of death, the sombre mood created by the monochromatic shades of blue, and the haggard, depleted protagonist are all examples of indexical signs. Through a semiotic glance I have explored how death is linked to the Picasso painting the Old Guitarist. Investigating the correlation between language and the sign enabled me to decipher how the arbitrary nature of language, dictates to us how we should interpret the image; but without language the image is open to our own interpretation. Rene Magritte’s’ idea of distorting the meaning of the pipe enables us to understand, the importance that language plays in comprehending the meaning of an image. Therefore, once language has been either manipulated or discarded in this context, it opens up additional interpretations for the viewer to consider. Crow, D (2010) Visible Signs: An Introduction to Semiotics in the Visual Arts. Worthing: AVA Publishing. 2nd edition, p21. Moore, W, Bergmann, G and Dotterer, H (1942) The Indexical and Presentative Function of Signs. Volume 9, issue 4. Chicago Illinois: The University of Chicago Press, pp367-375. The Old Guitarist by Picasso (1903) Available at: www.pablopicasso.org. (Accessed 23/2/14).